May 2015 – LIFE AS I SEE IT – with one eye closed. 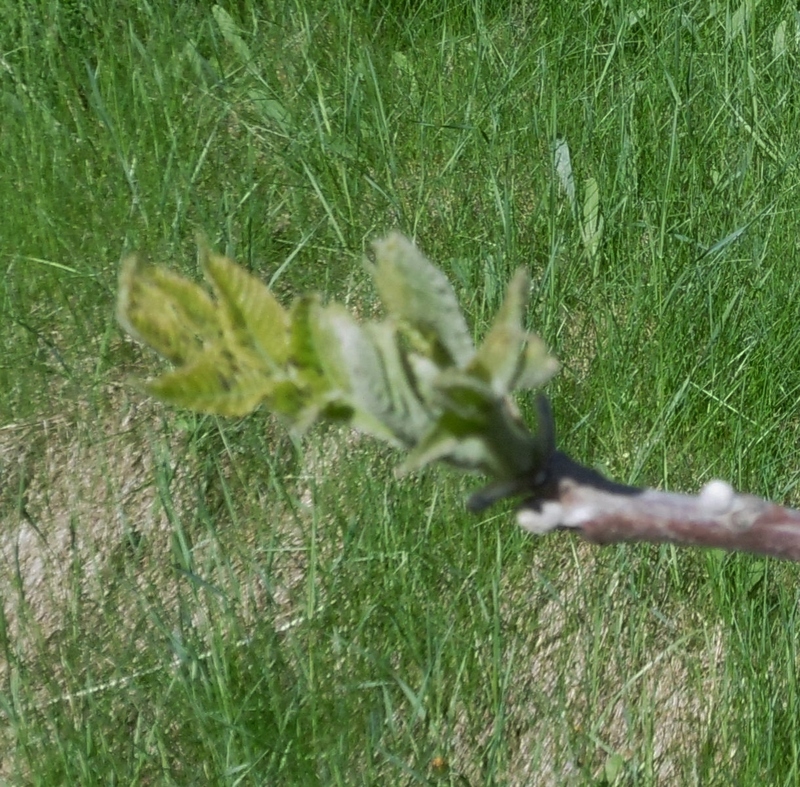 My spring assignment which I have chosen to accept is to document by photographs the leafing out of a young tree in my area. My weekly walks takes me right by it. But we are off to a slow start. One week is mild, the next there is snow on the ground with temperatures below zero. Keep in mind this is still the 3rd week in April. This is going to require patience on my part. This week shows great promise; lots of sun and warming nicely. What kind of tree is it? Next week I will have to put my sleuthing hat on and hope I read all the clues correctly. This is not a very big tree, now. Someday it will tower above the spruce in the background. It will certainly outlive me, I hope. 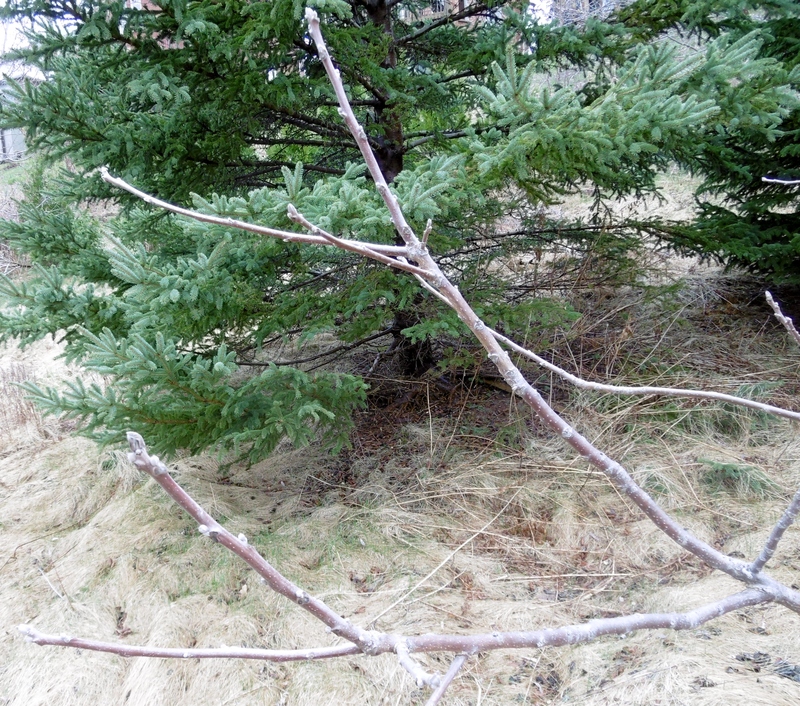 It is hard for me to understand how something this fragile and skinny has the means of surviving our winters. And yet, here it is. My detective work tells me that this is an oak tree, based on the dead leaves at the base. The hunter-gatherers of the Fertile Crescent at the east end of the Mediterranean realized some 10,000 years ago that for a plant to thrive it must first appear to die. And so it is today, new life springs from what appears to be no life at all. So here we are in the 3rd week of May and many of the trees in my area are in full leaf and a most welcome addition to Spring. 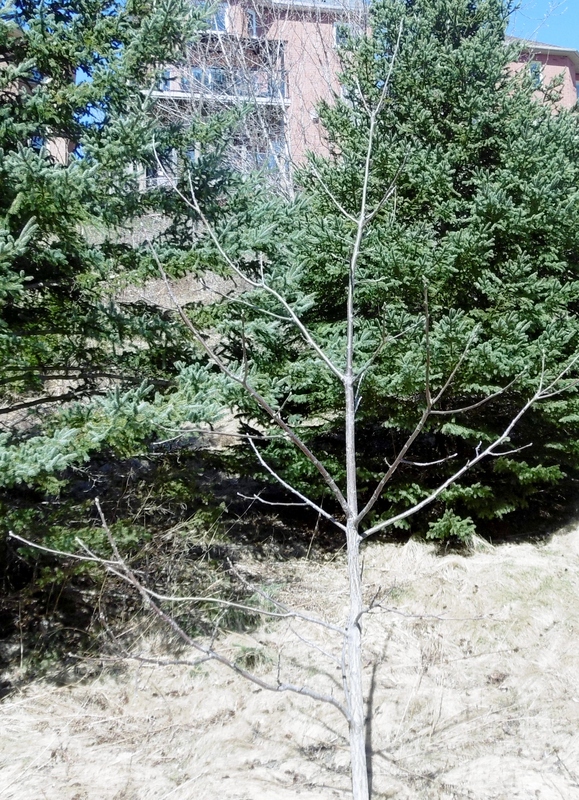 My little tree, well finally there is evidence of a leaf escaping winter’s grasp. I am sure this tree has a lot more patience awaiting Spring and the life giving warmth than most humans. We are seldom satisfied with our lot as regards to weather even though we know full well what to expect! As to my sleuthing ability, I would not make a good arborist. 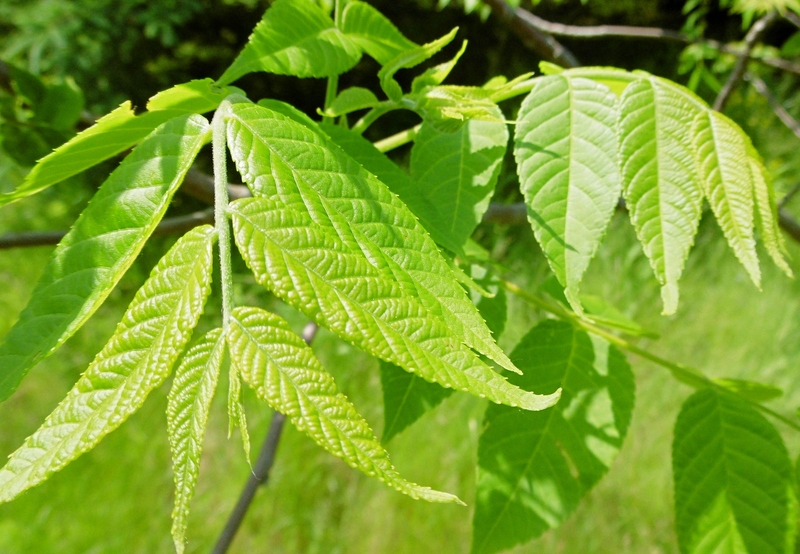 The leaves are jagged and not lobed as in an Oak tree. More on that later. It is now June, and my tree is fully leafed out, to be totally appreciated. 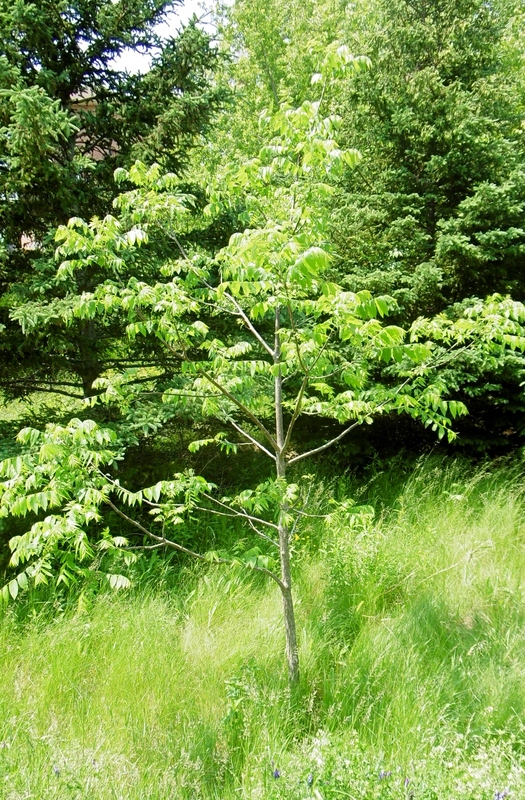 After digging around several websites, I am going to say it is a hickory tree. My mistake in calling it an oak. Never got this close to watching a tree come to life. As with so many aspects of nature, we tend to just walk on by. I am glad I did not.